What a different a year makes. This time last year I returned to Colorado from Ohio, having taken part in a class that changed my life. The class is called FASTER, which stands for Faculty / Administrator Safety Training and Emergency Response. The program offers medical and firearms training for school staffers authorized to be armed on their campus. 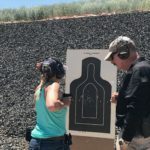 It began in Ohio, where Buckeye Firearms Foundation has trained this curriculum to more than 1,000 school staff members in the past five years. I don’t work in a school, so how did attending FASTER change my life? When I got back from Ohio, I wrote a blog called Keeping Kids Safe in a Broken World. I was in awe of those who attended the class. They all vowed to place themselves between bullets and kids as part of training to learn how to stop the threat in order to save lives. Heroes all. I was committed to bringing this lifesaving training to Colorado’s schools. Less than 11 months later, Coloradans for Civil Liberties (CCL) and Independence Institute brought FASTERtraining to Colorado’s school staff members. And the media took notice … regardless of ideology. BBC, STV in Scotland, and various Latin American stations such as Prensa Latina. In total, Colorado’s inaugural FASTER class has had nearly 80 media mentions. And nearly all of those mentions were neutral to positive in their coverage of armed staff. That caught me by surprise. Even better? All the mentions about CCL and Independence Institute providing this advanced FASTER training at little to no cost to the teacher, school or district, were positive. There is growing national acceptance of the idea of armed teachers. Ohio has trained more than 1,000 school staff in the past five years. States like Pennsylvania are in the process of passing legislation to allow school districts to authorize staff members to be armed first responders on their campus. Colorado has had this law on the books since 2004. Some states, such as Utah, have never disallowed the practice. And there have not been any of the issues commonly pointed to by opponents of armed school staff, such as negligent discharge or students coming across the staff member’s firearm. If you are in Colorado and are a school staff member or school board member who wants to know more about this training, you can find out more information about the program. Or, just send me a note with how I can help. If you are outside of Colorado and want information about bringing FASTER to your state, reach out to the great folks in Ohio who got this ball rolling. If you love this idea of armed school staff, help us train those who are on our waiting list. In Colorado, we have enough on the waiting list to fill two more classes, and we’re currently raising money for partial or full scholarships for those who don’t have the budget for the full $1,000 class cost. It’s easy for you to help, and it’s tax deductible. Just go to Independence Institute’s contribution page to help us cover the cost of training. Be sure to type “FASTER” in the “Optional Contribution Description” field to make sure that your gift goes straight to FASTER Colorado. Join me in this mission to keep Colorado’s school children as safe as they can possibly be.